Hypervenom has changed. Hypervenom has advanced. 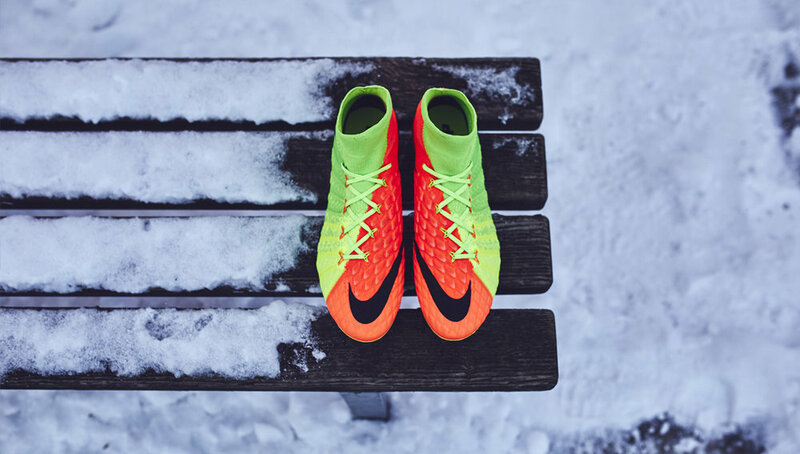 Nike launch the third generation boot with every aspect created for the finisher. Led by a new line-up of players, including latest convert Marcus Rashford, the Hypervenom 3 has undergone a radical makeover for a fresh Flyknit feel. Goals, goals, goals. Nike have well and truly got their 2017 underway in colossal style. The Nike Hypervenom 3 football boot is designed to do two things above all else: cut and strike. With these critical components of goal scoring in mind, the Hypervenom is twisted into a new look with a number of key technology advancements, including the introduction of a new, and far more flexible plate. The changes ring right across the board, none more so than on the vibrant upper. The strike zone of the boot features multi-layered Poron foam pods integrated into a Flyknit upper. The pods are rate dependent, creating a dampening soft touch at low velocity contact, but activating rigidity when striking the ball with high velocity to create a firm launching pad for a true strike. Clever, right? Flywire cables enable the player to fine-tune the fit at each loop for a more precise lock-in to support lateral cuts. Further lateral stability comes from Hypervenom 3’s new Dynamic Fit Collar. Ah, and the lo-cut Phinish silo is Nike's first lo-cut Flyknit boot. So, yeah, this is a biggie.